On MLK Day UPMC workers, faith leaders, and community members gathered to honor Dr. King’s legacy of fighting for worker justice by calling on UPMC to pay all its workers a living wage. Members of the Pennsylvania Interfaith Impact Network (PIIN) kicked off their campaign for economic justice with a prayer vigil outside of UPMC Presbyterian in Oakland. Nearly 100 from Pittsburgh’s low income communities ignored the bitter cold to join ministers and other people of faith as they launched PIIN’s “Love Thy Neighbor” campaign and call on the global healthcare giant to end to its anti-worker campaign and to pay all of its employees a real living wage. 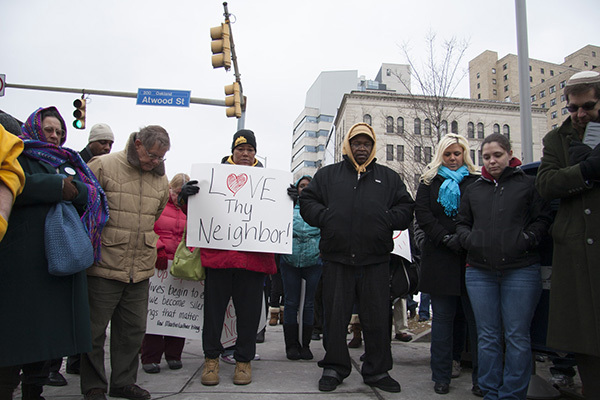 Mobilizing people of faith to stand up against economic injustice, clergy from PIIN called on UPMC to end its anti-worker campaign and help life thousands of Pittsburgh residents out of poverty. 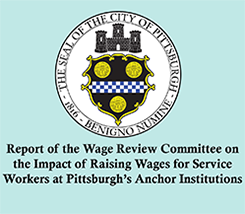 “The faith community, through the Love thy Neighbor campaign, recognizes the moral imperative to act and call on UPMC, the largest employer in this region, to do the right thing and lift families through family sustaining wages,” said Rev. John Welch, a minister whose involvement with UPMC workers goes back more than a year, when he accompanied employees and elected leaders to the Presbyterian Hospital Board meeting, to ask Board members to put an end to UPMC’s vicious and expensive anti-union campaign. 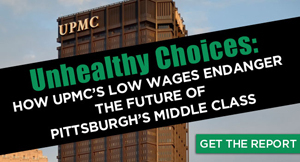 Experts calculate that UPMC’s wages leave thousands of service workers — UPMC’s largest group of employees — living with less than Pittsburgh’s “no-frills” budget requires. They rely on food banks to put food on their tables and federal housing assistance to keep roofs over their heads. Despite being a charitable hospitals system, UPMC employs the third largest number of full time workers in our state who rely on Medicaid for health insurance, after Walmart and McDonald’s.